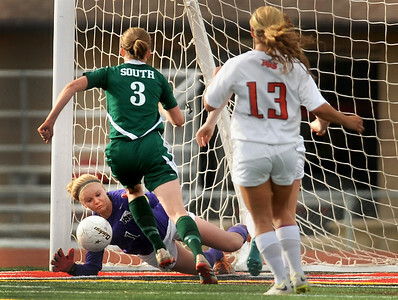 Michael Smart / For Shaw Media Huntley goalie Jessica Galason stops a potential goal by Crystal Lake South Saturday, May 17, 2014 at Huntley High School in Huntley during the Class 3A Huntley Regional girls soccer championship game. 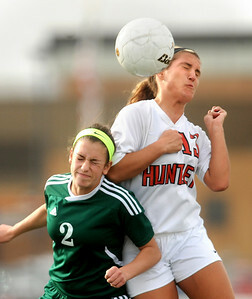 Michael Smart / For Shaw Media Crystal Lake South's #2 Katherine Siavelis and Huntley's #13 Jenna Hermansen go to head the ball Saturday, May 17, 2014 at Huntley High School in Huntley during the Class 3A Huntley Regional girls soccer championship game. 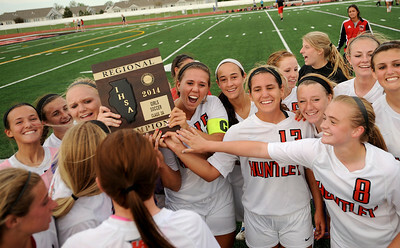 Michael Smart / For Shaw Media Huntley girls soccer team members hold up the IHSA Regional Championship plaque Saturday, May 17, 2014 after beating Crystal Lake South 2-0 at Huntley High School in Huntley during the Class 3A Huntley Regional girls soccer championship. 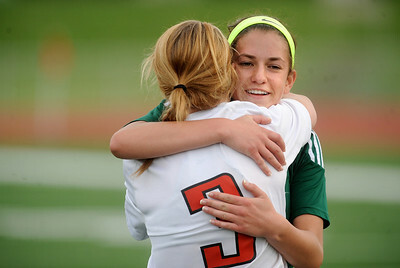 Michael Smart / For Shaw Media Crystal Lake South's #2 Katherine Siavelis gets a hug from Huntley's #3 Jessica Helm after Huntley beat Crystal Lake South 2-0 Saturday, May 17, 2014 at Huntley High School in Huntley during the Class 3A Huntley Regional girls soccer championship game.